Italy and the United States share a long history mutual influence and support. From Filippo Mazzei, who influenced Thomas Jefferson’s ideas on liberty and democracy, to the vast influx of Italian immigrants who contributed to American culture, to modern Italy’s role as one of the U.S.’s most important allies, Italy and the U.S. have a longstanding friendship. 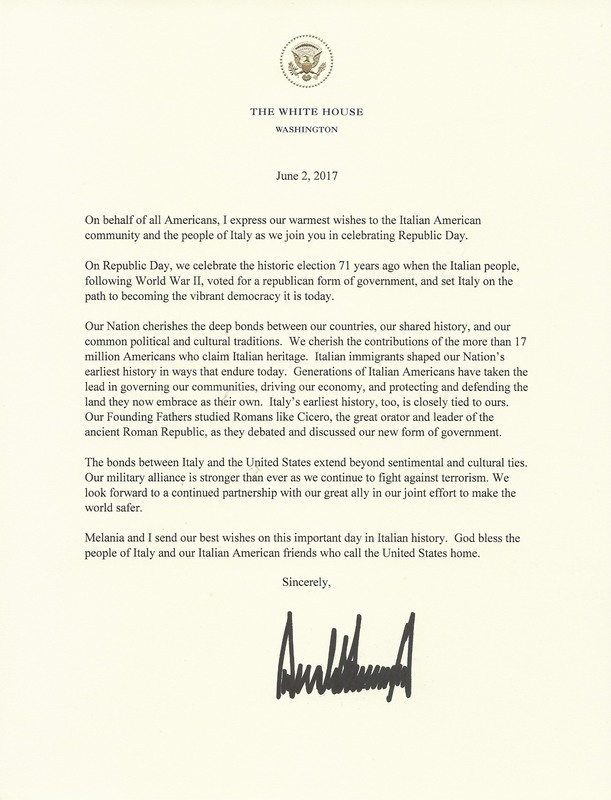 This month, Italy celebrated its 71st Italian National Day, also known as Republic Day, or la Festa della Repubblica, and the National Italian American Foundation (NIAF) was honored to join in its celebration at the Embassy of Italy on May 30th as well as at an event at the White House on June 2nd. This national holiday commemorates results of an institutional referendum which was held in 1946. After years of struggle with the Second World War, as well as the fall of fascism and the monarchy, the Italian people came together after the end of the war to decide on what form of government they wanted from that day forward. Taking to the polls, 10,719,284 people voted for the monarchy, but 12,717923 people voted for a republic. As a result, the royal House of Savoy was sent into exile, and the Republic of Italy was officially established. 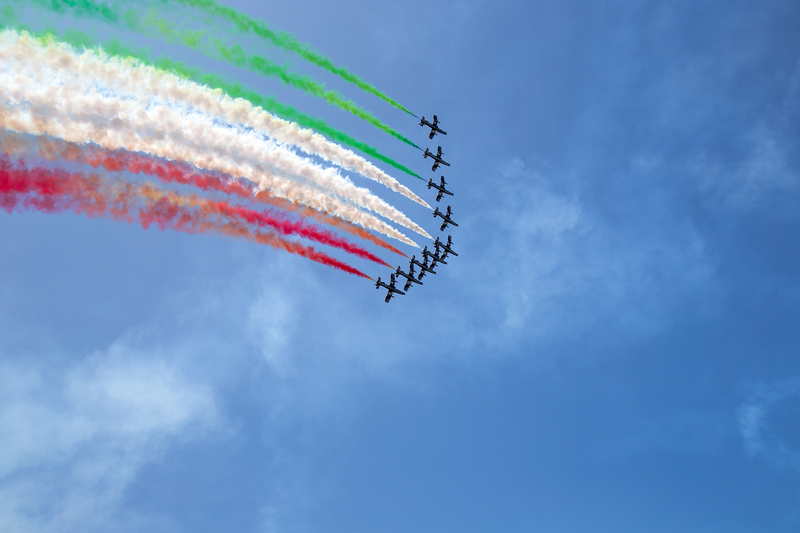 Today, the holiday is celebrated by a grand military parade in Rome, where the President of Italy, the Prime Minister, the President of the council of Ministers, ambassadors, and military leaders are all in attendance to mark this example of democracy. This year, in addition to the annual celebration at the Italian Embassy hosted by the Ambassador of the Italian Republic to the United States, the White House held an event in the historic Roosevelt Room in the West Wing to mark this holiday and honor the enduring relationship between our two countries. Members of NIAF’s board and leadership council; Ambassador of the Italian Republic to the United States, Armando Varricchio; Italian embassy staff; members of the White House staff of Italian American descent; members of the Italian American Congressional Staff Association, as well as other special guests, came together in the West Wing to celebrate these deep bonds that define our two nations. Several White House senior staff are of Italian descent including Counselor to the President, Kellyanne Conway, who spoke about her memories of being raised by her Italian American mother and aunts and the example of hard work they instilled in her. Assistant to the President and Director of Social Media Dan Scavino spoke about the President and First Lady’s recent trip to Italy for the G-7 Summit in Taormina and to the Vatican, and read President Trump’s statement recognizing Italian Republic Day, which highlighted how America’s founding fathers studied Italy’s earliest history when debating the form of government our new nation would take. “We cherish the contributions of the more than 17 million Americans who claim Italian heritage,” stated President Trump. He acknowledged that our bonds “extend beyond sentimental and cultural,” but also to the protection of our two nations’ security through our military alliance and joint efforts to combat terrorism and make the world safer. Also in attendance at the June 2nd event were Florida Attonry General Pam Bondi and New Jersey Governor Chris Christie, who spoke about his Italian American mother and the importance of family. Andrew Guiliani, also a member of the White House staff, introduced his father, former New York Mayor Rudy Guiliani, who addressed the experience he had of meeting with President Ronald Reagan in the Roosevelt Room over 30 years ago as an attorney in the Justice Department. NIAF’s Vice Chair of Cultural Affairs, the Hon. 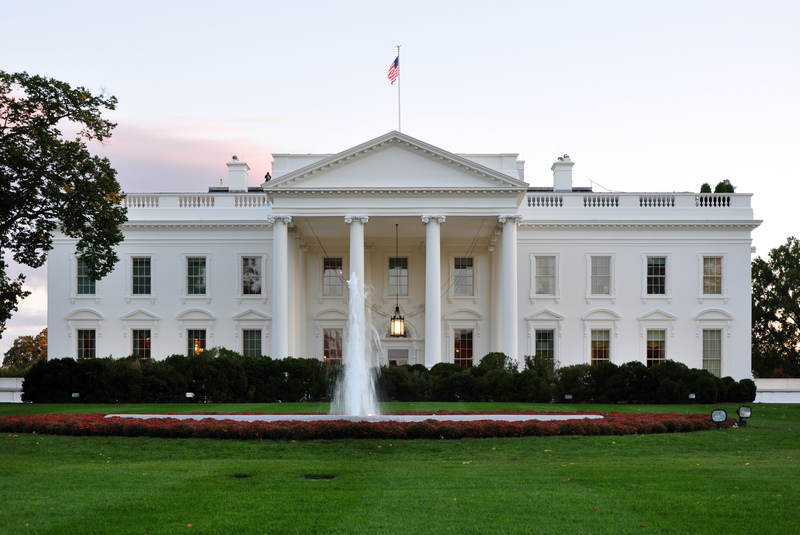 Anita Bevacqua McBride, who assisted White House Deputy Director of the Office of Public Liaison (and fellow Italian American) Stephen Munisteri in the planning and execution of the event, was one of NIAF’s representatives at the White House on June 2nd. 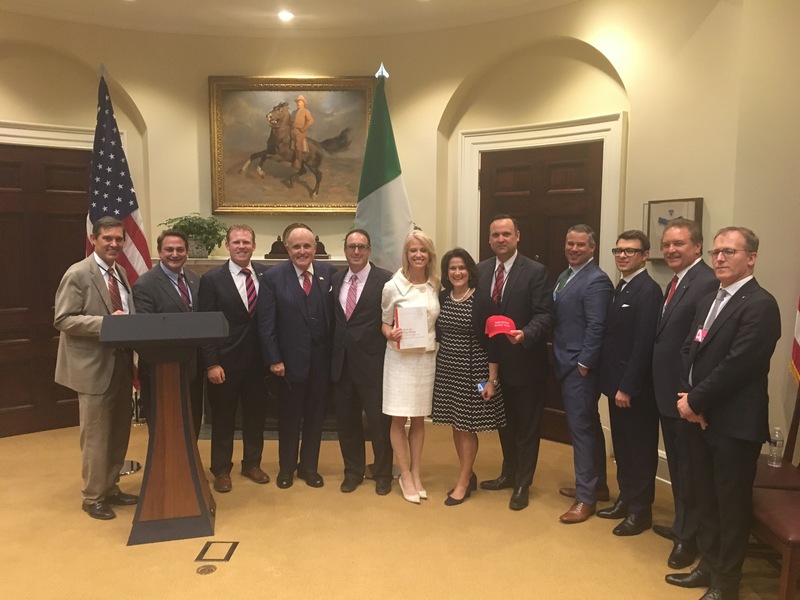 She presented two gifts to Ms. Conway for the President, including the “Make Sunday Italian Again” ball cap designed by NIAF President John Viola, and a copy of the “Italy in the White House” book published by NIAF and the White House Historical Association. For many there, celebrating Italy’s Republic Day in the United States – specifically, in the White House itself – was a momentous occasion. 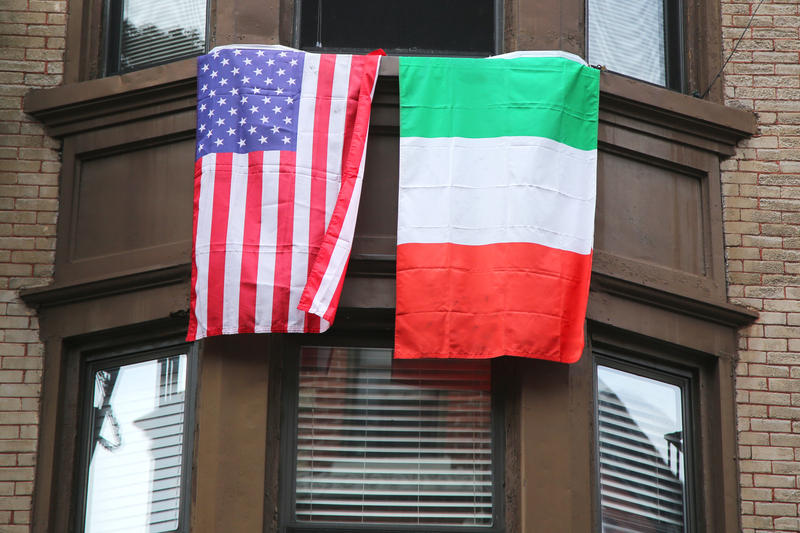 For decades, Italian Americans struggled after immigrating to the United States. Forced to fight discrimination and lack of representation in both American culture and government, it was not too long ago that the idea of an Italian American in a high-ranking public office was nearly inconceivable. Today, Italian Americans make up a large portion of our nation’s leadership, as we see often at our NIAF-organized Italian American Congressional Delegation events. NIAF continues to encourage and help facilitate a positive relationship between Italy and the United States, creating a community that still holds strong to our Italian values and culture. As Secretary of State Rex W. Tillerson stated on June 2nd, “This deep and enduring friendship, founded on mutual respect, trust, and affection is not one we take for granted,” and NIAF is proud to help build that bridge. When discussing the Italian American community in the United States at the Embassy of Italy’s celebration of Republic Day, Ambassador Varricchio warmly addressed the Italian Americans in the audience, stating, “I do consider you to be fellow ambassadors of Italy, here in the United States.” NIAF is proud to be ambassadors of our culture not only on the grand, national holidays of Italy, but in our daily lives and communities, celebrating our heritage and Italy’s legacy in the United States every day. Image | This entry was posted in Blog, Culture, Europe, Facts, Heritage, History, International, Italian, Italian American, Italy, National Italian American Foundation, NIAF and tagged Allies, American History, Celebration, Democracy, Donald Trump, Embassy, Embassy of Italy, Festa della Repubblica, History, International Affairs, International Relations, Italian, Italian American, Italian culture, Italian Embassy, Italian Heritage, Italian History, Italian National Day, Italian Republic, Italian Republic Day, Italy, June 2, National Holiday, National Italian American Foundation, NIAF, Nonprofit, Nonprofit Organization, President Trump, Roosevelt Room, The National Italian American Foundation, Trump, United States, White House, White House Historical Association, World War II. Bookmark the permalink.